Hindu funeral rites are very unfamiliar to Western eyes. I couldn’t see much, standing behind dozens of others. Some were holding camera or cell phones above their heads. I, too, wanted to memorialize the day, but couldn’t bring myself to take pictures. Besides, I won’t forget the informal gathering, so unlike the hushed, orderly funerals that I’ve attended. Within the family circle, rituals are sacred and specific, while the larger gathering is spontaneous and open to the public. Traditionally women aren’t permitted to attend the ceremony, but Geeta apparently modified this rule. The cremation ground was simple and exemplified Pune: open air, cement and dirt, covered by a corrugated metal roof. Where I was standing, there were several pyre pits, some still ashy, in a row–and we had to be careful not to fall in. It was witheringly humid, the air so damp that I was dripping just standing there. The crowd, comprising a mix of locals and visiting students, was large, but modest for a man of Mr Iyengar’s stature. That’s perhaps due to the immediacy of Hindu cremation; those from afar can’t make it on time. When the pyre was lit, the smell of smoke filled the covered structure–another unforgettable experience that cannot be captured on film. Eventually Geeta, dressed in white, was helped out by teachers Raya and Uday and then her sisters, wearing colors. The fire burned bigger and brighter, by the time the crowd was dispersing. I rode a rickshaw home with a familiar Italian classmate I’ll call Stefano. Before his first trip to RIMYI, his father, who had a wild white mane just like Mr Iyengar, passed away. When Stefano first arrived, he saw Mr Iyengar from the back. When he turned around, Stefano saw his father in Mr Iyengar. He commented that I’m lucky: to have seen Mr Iyengar alive; to be here on his death. “It’s synchronicity,” he said. “It’s once in a lifetime, to see this celebration.” He repeatedly called the funeral a “celebration”; I wondered if he meant “ceremony.” But maybe it was intentional. Maybe I am lucky. Of course, I still wish that I’d come to Pune sooner. Why wait? A day’s delay turns to weeks, months, and years. Time flies. Even 95 years. What an honor to be there during the passing of such an incredible person. Thank you so much for sharing your experiences – a thousand times more poignant to read what you are witnessing than to get it from a generic news source. Sat nam. We are very grateful for sharing your experience there. Very special. Thank you for sharing. I am glad you are there. Your talented writing skills are needed for all of us at this time. What a historic time to witness following a life well lived. Luci, we so appreciate your updates. You are our eyes in Pune. This is the most poignant one you have posted so far. It must have been a very intense experience. I think you can count yourself fortunate, in a strange way, to have witnessed such a momentous event. Oh Dear… What can I say? I’m sad. Of course we know that he had a full, happy, meaningful, long life. A life that we, yogis, hope to have. But I can’t pretend that I’m not sad. Not only because I will miss him (though I did not have the good fortune of studying with him in person), but also because whenever someone dear passes away, there is always a part of us that thinks about our own death. And also about our lives. You said it all. Time flies. Are we all living our lives the way we want to? Are you all fully enjoying the divine gift of life? May we all have long, meaningful, happy lives! May we all be protected. Om Sahana Vavatu Sahanau Bhuknatu Saha Viryam Karavavahai Tejasvi Navaditamastu Ma Vidvishavahai On shanti shanti shantihi. I agree with Sheri. Thank you for being there and sharing that extraordinary, sacred experience, bearing witness for us all. This is beautiful. Thank you so much for these words. I could feel you there and felt myself in your words. Wishing you well for the rest of your journey. 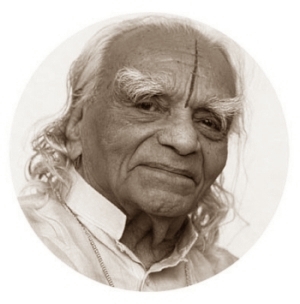 Luci, I like the idea of celebrating this Mr. Iyengar’s life. Thank you so much for keeping us in your thoughts and knowing we would be interested in hearing that you witnessed such an incredible time. Thank you for you simple and moving blog post. I both smiled then cried at your mentions of Geeta – first modifying the rules (so her) and then at the description of her being helped from the ceremony by Raya and Uday. Waking up this morning to your post has, in some small way, helped. Blessings. thank you for sharing your personal account of this event. it was very special to read. Thank you for sharing. I wondered how this ceremony was. And the end of your text is soooo true! So privileged to be passing and become a part of the burial. He will return soon. Thank you for sharing his final journey. I visited Pune in 2001 and whilst not taught by him, he was often in the room when Gitaji was teaching and he would come to the personal practice mornings also. I have never encountered anyone so radiant and full of grace. I have nothing but deep respect and gratitude for Guruji, and for everything he has given to so many people. Yoga by his method, changed my life. I am forever grateful. So, thanks for sharing this amazing final journey. Thank you for a beautiful writing of your experience. You were blessed to be there. Hari Om. Thank you, Luci. How interesting that you are there to witness for so many of us. Very powerful. And courageous.